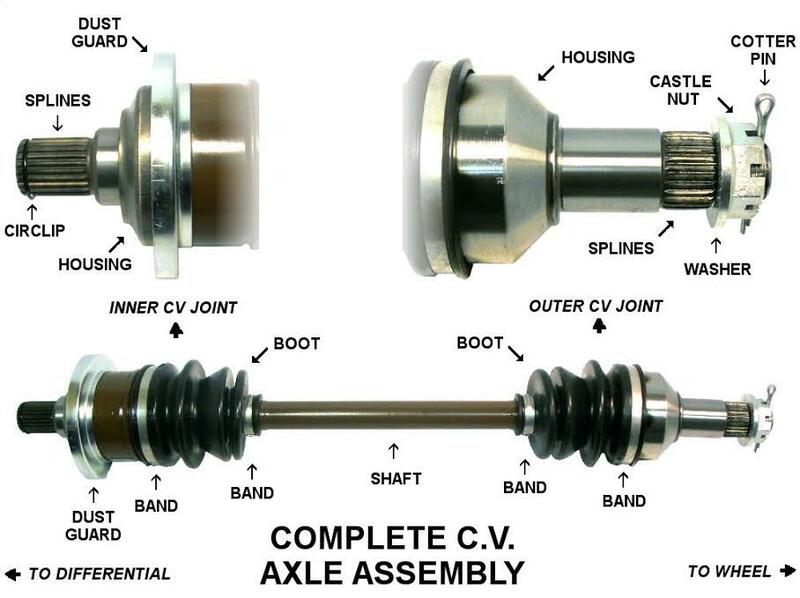 Axle shafts, or CV axels, or half shafts are made up of four components: the shaft (a narrow pole-like part), CV joints, grease and the boots (the containers for the grease). The purpose of the axel shaft is to enable the wheels to rotate. In today's vehicles there is one half shaft connected to the left wheel and another connected to the right wheel. Each half shaft is connected to the transmission which rotates the axels, that in turn, rotate the wheels. The axel components are structural, weight bearing and designed for the type of vehicle in which they are installed. They must carry the weight of the vehicle plus passengers and cargo. A constant velocity or CV joint enables the shaft to rotate while transferring power consistently to the wheel without a great increase in friction or heat and it allows the wheel to move easily. Grease is contained inside the boots to lubricate the CV joints. Today the axels, whether new or remanufactured, come with the boots already installed and pre-lubricated because the molysulfide-dope grease specified for CV joints is the nastiest, stickiest and blackest grease imaginable and impossible to come off of skin and clothing. Failure often occurs in an outer CV joint since they run at the highest angularity, meaning as the wheel turns the joint must send the torque from the engine to the wheel at an angle, and the more acute the angle, the more the strain on the joint. As we drive on the left hand side of the road in the USA, we usually turn sharper around right corners causing more wear on the right axels. Another common repair is a boot that fails from age or being torn. If a boot is torn the lubricant leaks out allowing dirt, water and debris inside the joint causing eventual wear to the entire axel. To test if your vehicle needs axel repair then take it out into a large open space such as a parking lot, and drive slowly in small circles. If your vehicle makes a cracking or clicking noise, you have a worn joint. Just a few years ago a repair involved removing the damaged axel and taking out the failed joint, replacing the axel and the joint, lubricate both the new and old joints with fresh grease and off you went. Today the industry standard is to replace the damaged axel with a remanufactured or new axel that has the boots already installed and lubricated. This service is very important as the axel shafts connect the transmission of your vehicle to the wheels. Damage to any of the components can lead to the axel not functioning, the wheels not turning and the vehicle not not moving. We will gladly perform a visual inspection of the axels and boots on your vehicle and determine if there is a lubricant leak and/or a clicking noise or a vibration indicating a worn joint.